If someone would have asked me a mere 12 hours ago what the difference between a and a hotel, I might have had some challenges nuancing the differences. The decision to book the hotel in Bellingham, Washington was a financial one. Was a STAR worth an extra $40 a night? I just didn't think there would be a huge difference between the Best Western and the Comfort Inn. When I got to my room, it had the requisite huge flat screen TV, it had a microwave and a frig- amenities I definitely appreciate. The truth is, I may never have known the difference if I didn't need to use the ironing board. After opening it, I looked back in the closet to get the iron. But it wasn't hanging on the closet wall where all hotels hang their irons.. . It took a couple of minutes but then I saw the iron was already on the ironing board. Thinking that was pretty cool I tried to lift the iron, but it had a limited range of motion because it was locked to the ironing board. Can I just say this creeps me out about as much as finding a rodent in the bathroom and I assure you, finding a rodent would cause me to hyperventilate. Suddenly, instead of being annoyed that I had to use the iron and ironing board in the first place, I started thinking about the back story of why a hotel would need to lock an iron to an ironing board. I didn't like the back story I was building. It was a dangerous back story full of people of questionable character and motivations. 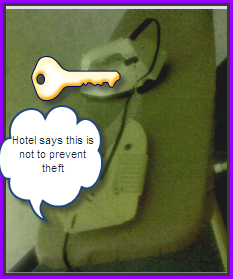 If a hotel feels it's not safe to leave an iron unlocked, how safe are the guests? Needing some answers, I went to the front desk and asked how long ago they implemented their locked irons? The clerk shared it had been a couple of years. So much for my theory that the economy was driving people to steal hotel irons. For a nano second I felt better,until the clerk shared that the reason for the locked iron is to prevent guests from burning the furniture. Oh yeah. That made me feel a lot better about the other guests in the Comfort Inn.